Bessesen, B.L. & Galbreath, G.J. 2017. A new subspecies of sea snake, Hydrophis platurus xanthos, from Golfo Dulce, Costa Rica. ZooKeys 686: 109–123. doi: 10.3897/zookeys.686.12682. Reference page. Uetz, P. & Hallermann, J. 2019. 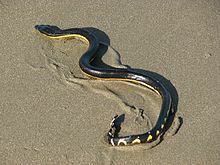 Hydrophis platurus. The Reptile Database. Accessed on 25 July 2017.